You missed the point; it’s not the number of votes Sang has that matters, it’s what he said that does and no doubt will move huge number of votes to Raila column. I know Synovate is coming out with their latest numbers tomorrow but they may have to go back and redo the exercise to reflect movement of votes in RV that’s already occuring thanks to Ruto and Sang signalling to the Kalenjin vote for Uhuru at their own peril. This is what we have been saying all along but nobody believed us. The Kalenjin are saying enough of the lies now we want the truth about who’s serious about addressing our issues and they are concluding in large numbers that person is not Uhuru but Raila. The voting will reflect that fact as Raila is reelected but this time sworn as president. Raila has been saying Mambo Bado but I am not sure people knew what he was talking about; this is just the beginning of many strategic executions in the remaining few days to Election Day to make sure Raila is reelected but this time sworn as our next president–in Round 1, if I may add as a reminder to those who have forgotten we have been saying all along there will not be Round 2. In politics, timing is nearly everything. These things don’t happen in a vacuum; you can assume they have been in the making and many others to follow before Election Day. A reliable source tells me Infotrak, which is to release its numbers tomorrow has been pondering whether to delay the release and redo the survey to reflect both Ruto’s public reconciliation with Raila and now Sang’s significant and loud declaration of the truth many have known for a long time–it really doesn’t matter because we know these two events and others to follow will in the end be the key defining moments of 2013 elections. You can take it to the bank Uhuru would not garner even close to half of what he and others who don’t understand the dynamics of RV have been counting on. He can walk tall with his head up after he loses if he harvests 30% in RV, which is less and less unlikely. You have to take these two events of Ruto reconciling with Raila and Sang endorsing Raila to mean even the two have come to accept what has been said openly in the region since Ruto abandoned his presidential bid to play second fiddle to UK–an anathema to most Kalenjins,especially the wazees who drive the votes. BTW, Raila is not winning the propaganda war; he’s winning the battle of who is best suited to lead our country this time and most Kenyans agree he is. He’s merely winning over those who may have had their doubts, legitimate or not. The truth and fact to be soon confirmed is this thing won’t even be close and will be over with in Round 1 with Raila and Cord emerging at the top much as was the case in 2007, the difference being this time around Raila will actually be sworn as our next president. Those majestic words are appropriate to start practicing by those who have been in doubt or having their heads buried deep on the ground–or let them prepare to hear them for a long time to come beginning next week. No Maryanne, I am not saying that the whole of Rift Valley has now moved with Sang to Cord; I am, however, telling you the two events, Ruto’s reconciliation with Raila and now Sang’s open and loud declaration of the truth about Raila and issues dear and near nearly all Kalenjins, especially the wazees who will determine the vote, are major boosts to Raila’s fortunes in the area it’s impossible for Uhuru to reverse them–even with his reluctant running mate. Notice how muted Ruto has been lately, going back to late last year and that will tell you something; the man is practically endorsing Raila in his actions, or more importantly, his inaction. He (Ruto) is not stupid; he’s in fact, a very shrewd politicians who knows how to hedge his bets. Right now, he’s hedging his bets that Raila is unstoppable and thus how he has not been passionately promoting Uhuru in RV and did not even bother to have URP open offices in Uhuru’s backyard. If you recall, I blogged some time ago if Ruto were to decline the offer from Raila to rejoin ODM, I would state publicly why he would do so despite what he would and did give as a reason. I subsequently hinted at it and that’s really what is at play. But for that, Ruto will be fully Corded today but that’s okay, he’s and will do what he can to make sure the presidency doesn’t go to his running mate and that’s evidence of a smart politician, which he is. Had you finished the conversation, you’ll have been shocked the laughter turned into serious and loud wailing; the man is probably desperately trying to reach Raila in continued and uncontrollable sobbing. When it’s all said and done, Raila will carry RV by more than 70%. What Sang has said about Raila and ICC as well as Raila being the one who can resolve the historic land issues in Kaleland is nothing but the truth. 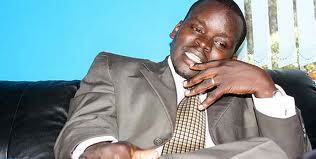 Kudos to Sang for stating the truth and aligning himself on the right side of Kenya politics 2013. The message must be spread far and wide for all to hear I trust Cord has already cut ads to start drumming the message immediately, especially in RV where it’s more relevant. NAIROBI, KENYA: Former radio presenter Joshua arap Sang has broken ranks with two suspects with whom he faces criminal charges at the International Criminal Court and endorsed CORD’s presidential candidate Raila Odinga ahead of elections next Monday. Sang has dismissed the coalition between William Ruto and Uhuru Kenyatta as incapable of bringing peace between two dominant communities in the Rift Valley who have fought during elections since 1992. In a recorded message to air on radio, Sang says only a president who is not from the two tribes will be able to bring peace between the two communities, concluding that he believes that President should be Raila. He has also dismissed as lies, the perception created that Raila could have sent him to The Hague, saying senior government officials who were in office before the coalition, not Raila, coached witnesses to testify against him and Ruto in the case at the ICC. “We are away in a foreign land with my brother because of allegations made against us. The truth must be told. In my opinion, the people who masterminded and planned to have me and my brother taken to The Hague did not include Raila Odinga,” Sang says. In the statement which Sang says he recorded because of “heavy feelings in my heart,” the journalist traces what he terms “broken MOU’s of the last two elections in Kenya, including the 2008 power sharing deal. Mr Sang, who faces charges at the ICC alongside Uhuru who is Jubilee Presidential candidate and his deputy Ruto, appeals to the Kalenjin community not to trust the power sharing deal in the coalition, saying such agreements have twice been disowned after elections. He cites the MOU signed between Raila and Kibaki in 2002 and the 2007 power sharing deal that brought the Grand Coalition Government into force as instances of broken promises that should make residents of the Rift Valley wary of the deal between Ruto and Uhuru. “Today, some of our people want us to enter into an MOU again through Jubilee. They never respected the MOU signed in 2002 and the power sharing deal agreed on in 2007. Why should we expect that the one our community has signed in Jubilee will be respected,” Sang says in a recorded message set to air on radio. According to Sang, the agreements have not been honoured and he doubts the one between Ruto and Uhuru will fare any better. Sang says that although President Kibaki and Raila were supposed to share power on a 50-50 basis, it never really happened and only one side of the coalition ran the country.